When Uncle Mo had to be scratched prior to this year’s Kentucky Derby, following the first defeat of his career in the Wood Memorial, the doubters came out in force. “Mo is overrated,” some of them said. “He wouldn’t have gotten the distance anyway,” others chimed in. I, on the other hand, recalled the words of poet John Greenleaf Whittier and dreamt about what might have been. Not that I would have played Uncle Mo in the Derby, mind you. 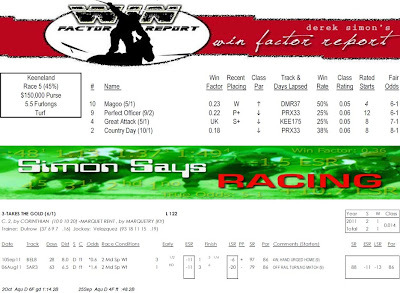 I’m a bettor first and a dreamer… well, somewhere after that. But I never doubted the colt’s talent. After all, this was a steed that had earned some of the best pace figures I had ever assigned to a juvenile when he broke his maiden by 14 ¼ lengths at Saratoga and then easily won both the Champagne Stakes and Breeders’ Cup Juvenile last year. And, frankly, although all the chatter was about Caleb’s Posse after he beat Uncle Mo by a nose in the Grade I King’s Bishop on Aug. 27, I thought Mo, who was making his first start since the Wood, ran great that day and looked primed for a breakthrough effort in the Grade II Kelso five weeks later. Uncle Mo won the Kelso like Kelso himself used to win the Jockey Club Gold Cup (something the amazing gelding did five times) — with speed to spare. Unfortunately, it looks like the naysayers could have the last laugh, as it now appears likely that Pletcher’s stable star will contest the Breeder’s Cup Classic on Nov. 5 at Churchill Downs. Unlike some, I don’t think the distance of that race (10 furlongs) is an issue, but Pletcher’s 6-for-77 record in Cup competition, including a 0-for-9 mark in the Classic, certainly is. Although she triumphed by a thousand lengths — well, OK, 8 ¼ lengths — in the Grade I Beldame last weekend, I was not impressed by Havre De Grace and wonder if there’s any more gas left in her tank. Maybe she was just taking it easy on Saturday, maybe it was the mud… but the Larry Jones trainee recorded a -10 late speed ration (LSR) in the Beldame — by far the worst figure of her career. Yes, I know Havre De Grace wasn’t pushed or “asked” for more speed once she assumed command down the lane, but neither was Secretariat when he earned a -3 LSR in the 1973 Belmont Stakes; neither was Spectacular Bid when he garnered a +1 LSR in the 1980 Woodward… in a walkover. One filly that did impress me a little bit last weekend was Plum Pretty, the Kentucky Oaks winner, who captured the Grade II Cotillion at Parx Racing on Saturday. Even though she didn’t face a lot of pace pressure (-4 early speed ration) in the Keystone State, she did earn a 114 Brisnet speed figure and -4 LSR… the kind of numbers I’d have expected from Havre De Grace. 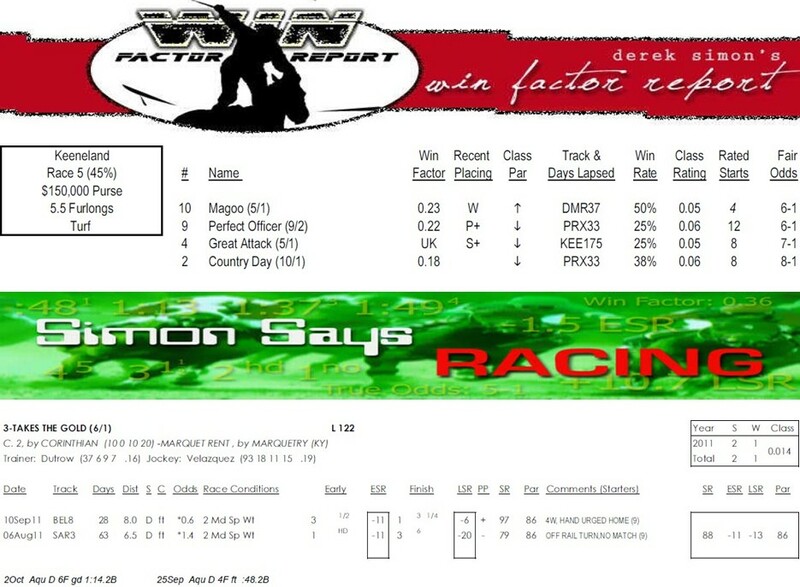 Click HERE to get free Win Factor Reports for Friday’s opening day card at Keeneland, Saturday’s races at Belmont Park, Hawthorne and Keeneland, as well as a free Pace Profile Report for all the big stakes races at those tracks.